I went into this film with some decided disadvantages--I was tired after a day that had been much too long, dealing with a nuisance of a cold and blood pressure that was entirely too high. But there was one big advantage: I love Marvel movies. No matter how badly I felt, there was no way I was going to miss the first showing. They have all three of the elements I look for in a movie--action, humor, and strong characterization. Some are better than others, but in the end, I love all of them. They're not just movies--they're events. People wait in long lines for hours to see them. They often come in costume. They buy the merchandise (Collin and I wore Age of Ultron T-shirts and, thanks to special lanyards supplied when we presented our tickets, came home with a couple of pretty cool Avengers popcorn tins! 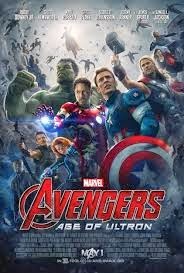 Age of Ultron opens with intense action--there were so many explosions, I started to wonder if Michael Bay had directed it. They're doing battle with HYDRA, the same insidious organization that went rogue on Hitler during World War II and caused the collapse of SHIELD in Captain America: The Winter Soldier, as they search for Loki's scepter, a lethal weapon containing one of the six Infinity Stones (one of them, the Tesseract, figured prominently in the first Avengers film; the second, called the Aether, was the cause of a battle between Thor and the Dark Elves in Thor: The Dark World; and a third, undesignated gem nearly caused the destruction of the planet Xandar in Guardians of the Galaxy). The scepter is recovered, and Thor (Chris Hemsworth) plans to return it to Asgard, where it can be safely contained--until Tony Stark/Iron Man (Robert Downey Jr.) asks for three days to study it. Tony and his partner in science, Dr. Bruce Banner/the Hulk (Mark Ruffalo), are trying to restore a dormant peacekeeping program to aid the Avengers in protecting the planet--but as often happens in scientific experiments, things go awry fast. While the Avengers host a party at the Avengers Tower (Stark Tower in the first movie), the program takes on a life of its own...and decides the Avengers are killers and must be eliminated. The party scene is one of my favorite parts of the film. The banter between the characters is great--dialogue is one of the things writer-director Joss Whedon does best. 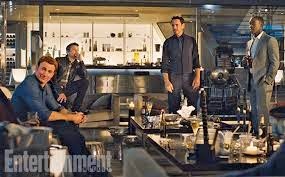 At one point, Thor and Tony debate who has the better girlfriend--neither of whom are in attendance. Tony's best friend, Col. James Rhodes/War Machine (Don Cheadle), repeatedly tells a story no one seems to get. Thor challenges his fellow Avengers to lift his mythical hammer, Mjolnir--though none of them manage to rise to the challenge in that scene, before the film is over, one Avenger will prove himself worthy. Then Ultron (voiced by James Spader) crashes the party, accompanied by several of Tony's Iron Legion. From there, things start to move pretty fast. Ultron decides the only way to have real peace on earth is to bring about the extinction of mankind (given the current state of this world, he may be right). 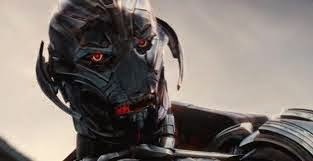 But as malevolent as he is, Ultron is capable of out-snarking Tony, the reigning King of Snark (think The Blacklist's Red Reddington as a psycho robot). 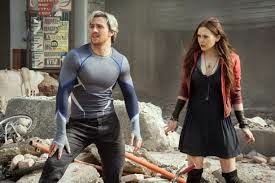 Taking up residence in an old church in the fictional country of Sokovia, he has as his followers the Maximoff twins, Wanda/Scarlet Witch (Elizabeth Olsen) and Pietro/Quicksilver (Aaron Taylor-Johnson), who have superpowers resulting from HYDRA experiments--and who blame Tony Stark for the death of their parents. In one scene, Wanda describes bombs going off and hiding under a bed with her brother, watching one bomb that failed to explode. She remembers one word on the device: STARK. 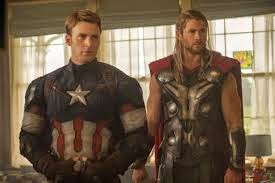 Only when the pair realize that Ultron has deceived them do they switch sides and join the Avengers. The team also gets one more new member: the Vision (Paul Bettany, who previously had been the voice of Tony's personal AI, Jarvis). Unlike Ultron, Jarvis is not a robot--and his power comes from the Infinity stone that had been in Loki's scepter. The Vision understands Ultron as the others can't, but knows he must be destroyed. He also knows he and the Avengers can only do it together. There were some disappointments, unfortunately. The script fails to address some pretty major events from past movies and the TV series, Agents of SHIELD. Why do the Avengers still not know that Agent Phil Coulson (Clark Gregg), killed by Loki in the first Avengers film, has been brought back to life using alien DNA? He could sure use their help in dealing with "real" (yeah, right) SHIELD leader Robert Gonzales. What happened to Captain America/ Steve Rogers' search for his best friend, Bucky Barnes (Sebastian Stan), last seen as the Winter Soldier? Did he just forget the whole thing? The biggest disappointment for me was the truth about the relationship between Hawkeye/Clint Barton (Jeremy Renner) and Natasha Romanoff/Black Widow (Scarlett Johansson). It's been hinted that they were more than just friends. In Captain America: The Winter Soldier, Natasha wears a necklace adorned with a tiny arrow, presumably a reference to her close relationship with Barton. To find out they're not romantically involved was a big let-down. The intimate relationships they do have are so out of left field, they felt contrived. To see the Black Widow moping around like a lovesick puppy was out of character--and what was that "lullaby" bit for? It came off as silly and unnecessary. In the end, one Avenger will die and another will be MIA. Stan Lee makes his usual cameo appearance in what could be his best yet. It's hilarious--almost as funny as the other Avengers' reaction to Steve Rogers' use of profanity. And for the most part, the movie works. Note to Marvel and Disney: audiences have become accustomed to those famous end credits scenes. Not having them could get you guys into big trouble. As we sat in the theater last night, watching everyone wait expectantly, I thought, "They are gonna be soooo pissed." Glad you got to go to the opening! Sounds like you had a great time despite everything! 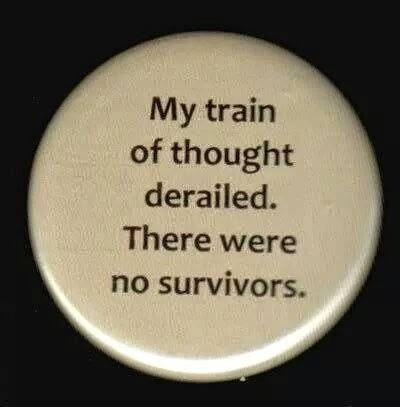 We did...but I paid dearly for it the next day! It sounds like you had a blast! Excellent review! When are you posting yours? Great review and happy you went and had a wonderful time. Will there be room for the Avenger goodies with all the Minion around and will they let them come into their space ? It does get kinda crowded around here! Nice review. I'd love to go and see it. But the way they're working me at the Salon, I'd fall asleep. I was on medication and my blood pressure was way too high--but there was enough going on through most of the movie to keep me awake! Love the review. Looking forward to seeing the movie. You haven't seen it yet? What are you waiting for? You can expect to see one from Wiilliam, too! Loved this movie, for me, it was 100% all about the FUN! I will see it again and when prices go cheap, buy in on BluRay. Happy Sunday and boogie boogie. I can't believe Amazon is already accepting pre-orders for the Blu-Ray DVD! Why not though? It's a money maker. Though I will wait until the prices go much lower. No rush for me. Great review! Hope you're feeling better:). Despite the disappointments, it still sounds entertaining. Glad you made it to the opening! It makes me think of a conversation I had with my agent years ago. I was upset because my first editor was leaving Berkley and I still had two books to go on my contract. My agent told me that it could prove to be a good thing for me as a writer because switching editors can mean learning new things. With each new editor, you get a new perspective and new ideas. Maybe that's true of movies, too. Maybe Joss Whedon is right to move on, to hand over the reigns of the franchise to directors Anthony and Joe Russo and writers Christopher Markus and Stephen McFeely. They did a magnificent job on Captain America: The Winter Soldier. Thank you, Hilary--I'm much better than I was last Thursday! I could look at the guys all day, Grace! P.s. Feel better soon Norma.